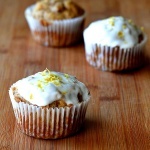 I can’t even begin to tell you how good these Apple Cupcakes with Creamy Lemon Yogurt Frosting are. If you just want a delicious apple cake, you can bake this in a 8″x8″ pan. 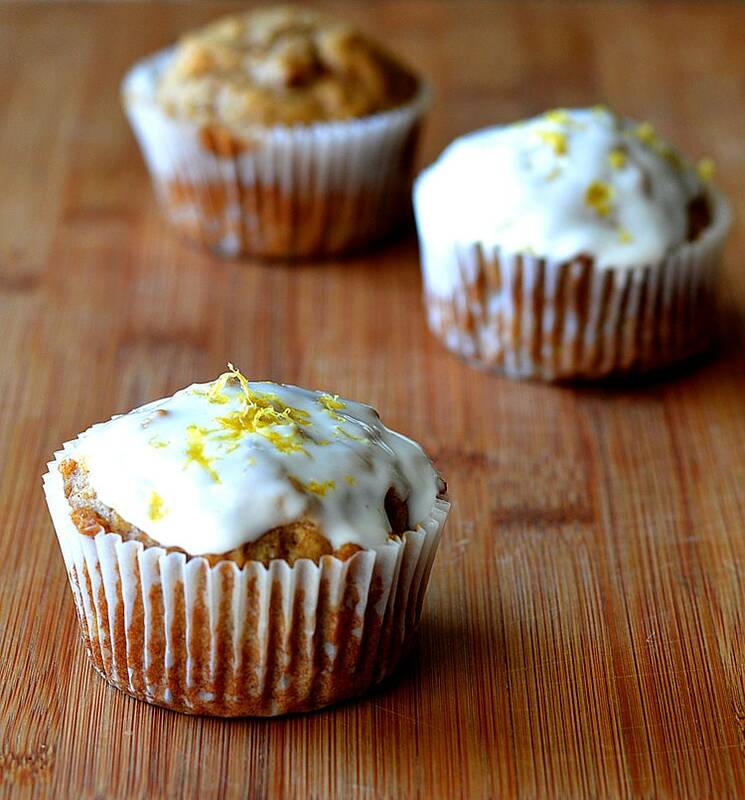 But combine the apple cake with this lemon yogurt frosting and it becomes heavenly! I kid you not. 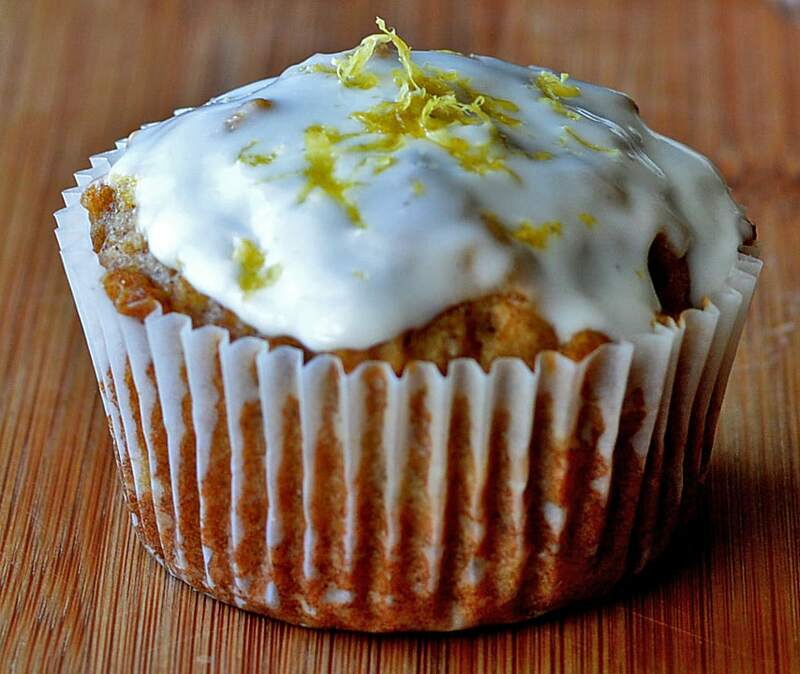 Don’t skip the lemon in the frosting or as the garnish. It absolutely makes this dessert special. The cake is made with homemade applesauce. I know what you are thinking, but don’t fret! It’s about as easy as it can be. I suppose you could use a ready made chunky applesauce, but it would contain more liquid and I mean…how hard is it to boil down diced apples for 10 minutes? The apples make this one of the moistest cakes you will ever make. If you want, you can make the cupcakes and put them in freezer bags and freeze them without frosting for later enjoyment. I always do this. It’s nice to be able to pull out a few at a time and you can whip up a batch of the frosting in less than 5 minutes. The frosting is vegan vanilla yogurt, vanilla extract, lemon juice, lemon zest and confectioner’s sugar. I chose to make mine a bit thinner…more like a glaze. Want a thicker frosting-like consistency? Just add more confectioner’s sugar or cut down on the liquids. 1/2 C Oil Coconut, Grapeseed, Canola, etc. Prepare a muffin pan with cupcake papers. Peel, core and chop apples. Add to a small sauce pan with 1/4 C water and bring to a boil. Reduce heat to medium and cover. Cook until apples are very tender. This takes about 10-12 minutes. Meanwhile, prepare the flax "eggs" and refrigerate. Measure brown sugar. Set aside. In a large bowl, combine all dry ingredients with a whisk. Mash apples with a whisk or fork. Allow to cook, uncovered, to dry out the mixture slightly. You are looking for applesauce with very little to no liquid. Add the brown sugar to the apples. Whisk until incorporated. Then, remove from heat and add oil and flax "eggs". Add your dry ingredients and stir until well combined. You can do this in an 8x8 pan but we chose to make cupcakes today. Using a large ice cream scoop, evenly portion out batter between the cupcake liners. Bake for 15-20 minutes or until a toothpick inserted comes out clean. Combine all ingredients for the frosting. Add less powdered sugar for a more glaze-like topping or more powdered sugar for a frosting-like topping. Garnish with a bit of lemon zest.